If you’ve recently jumped on the scales and realized you need to lose a few of those excess pounds, then perhaps you’d like to try The Body Reset diet. This new way of dieting has garnered a lot of attention over the last year, and it’s quickly becoming one of the best-rated diets for losing weight quickly and easily, without the usual struggles that most people face when it comes to changing their regular eating habits. With this in mind, we’re going to take a closer look at what The Body Reset diet really is, and how it can help you to reach your ideal weight – so let’s dig in. 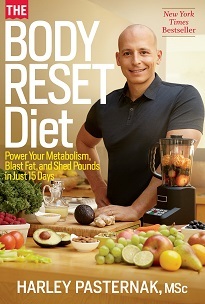 Firstly, The Body Reset diet was originally created by Harley Pasternak, who is perhaps better known for being a celebrity fitness trainer. But don’t let this fool you, he actually holds a masters degree in exercise and nutritional science, so he’s well placed to have a good insight into successful weight loss techniques. Additionally, Mr. Pasternak has worked with top celebrities such as bono, Alicia Keys, Kanye West, Lady Gaga and many, many more top names that prefer not to be mentioned! Finally, Harley has co-hosted a television talk show which airs on ABC, where he would often address these health and fitness issues. So what’s the focus of this new diet? Primarily, it claims to boost the overall speed of your metabolism, giving you a much needed ‘reboot’ which helps you to burn more calories naturally, even while at rest. This works by giving you a low calorie, low carb, plant-based diet for the first 15 days, which helps you to regain your insulin sensitivity (which often becomes drastically reduced thanks to the unhealthy modern diets most of us enjoy). After the initial 15 days, you’ll be invited to gradually reintroduce some of the old foods back, with a renewed focus on making healthier choices and picking low calorie, low carb alternatives whenever you can. What’s more, you’ll also begin a 3 day a week resistance training program, which studies have shown to really help you when it comes to losing weight and toning up. In fact, if you stick with this resistance training program as recommended by Mr. Pasternak, you’ll be shocked and delighted by the incredible physical transformation you can make – and it often takes little more than 6 to 12 months to experience the full benefits of this. One of the biggest difficulties people face when it comes to dieting and losing weight is maintaining the changes over a long period of time. Often, you’ll see great results in the first few weeks or months, only to gain all the weight back when you return to your old habits. Fortunately, this is where the Body Reset diet manages to really stand out from the crowd. Thanks to the metabolic reset it causes, you’ll find that you don’t pile the pounds back on so fast – and you may even get away with eating close to your old diet without gaining any weight at all. Of course, you may gain some extra weight if you were to abandon the principles of this diet completely, but you can always return to it for a few weeks for a quick ‘boost’ – which is especially useful just before summer. If you’re trying to decide on a new diet, then it’s a great idea to take a look at what other people are saying about it before you get to the hard work of following the diet yourself. Based on user reviews, it’s clear that the principles behind the Body Reset diet really work. The book that Mr. Pasternak sells is currently available on Amazon, and at the time of writing it holds an impressive score of 4.2 out of 5.0 stars – and this is based on over 300 different ratings. What’s more, he’s received great feedback from real, qualified nutritionists, who are all in agreement with the fundamental precepts that his dieting strategy is based on. For more details about the Body Reset Diet from Mr. Pasternak himself you can also check the video below that was published on the City Official YouTube channel… Have a great day!